Mice can produce large litters in a short time, so a couple mice can soon become an infestation and lead to big trouble for any home, school or business owner. Rodent experts say that a mouse infestation will continue to grow as long as the mice can find food and shelter and aren't ousted by competing species. Fortunately, most mice in the wild live only about three months because of the number of predators. Read some fast facts about mice and how to get rid of them. Outdoors and in the garage, mice can damage autos, lawn tractors, and bicycles by chewing through insulation, fuel lines, and seat upholstery. Indoors, their urine and poop can stain and contaminate pantries, food and dishes and their gnawing can ruin bagged foodstuffs, scar furniture and spill pet foods. Farmers lose untold amounts of grain and seed to the country cousins every year. House mice have large ears, are 2 to 4 inches long, are brown to grey, and have dark tails about the length of their head and body combined. Their droppings are 1/4 inch long and rod-shaped. Ridding a home of mice once they have become established may be difficult but glue/sticky traps and snap traps may be the best least-toxic solutions. 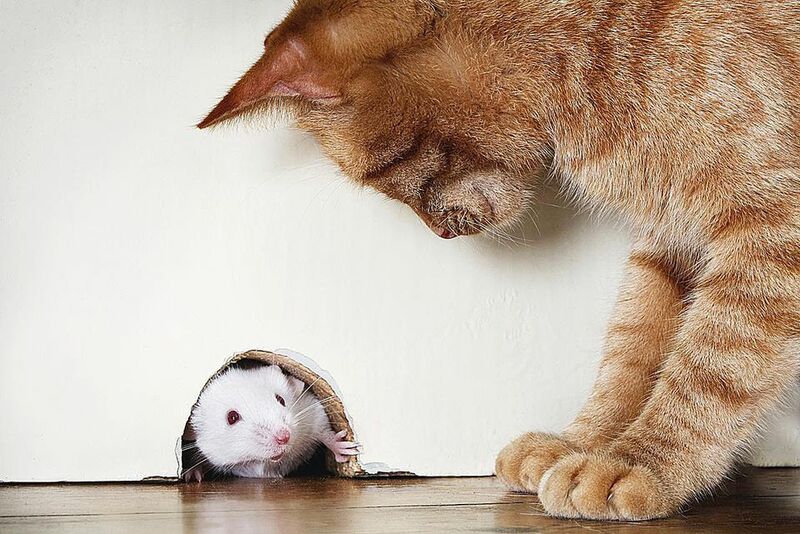 Cats can be effective against newly colonizing mice but are less effective against those already settled in, so you'll likely need other forms of control. Some mice have reportedly become resistant to the anticoagulant effects of baits and as with any poison, non-target species(pets and humans) and predators (owls, hawks, and snakes) are at risk, so poisonous baits should not be used. Additionally, ultrasonic pest repellers have not proven to be effective in the lab or in field testing. Seal, raise, cleanup, discard and store could be a mantra for mouse prevention. Seal utility entrances and attic vents with metal flashing or heavy mesh and install door sweeps and thresholds. Raise woodpiles off the ground one foot and move them away from the house at least six feet. Wrap outdoor pet cage legs with sheet metal if mice have been climbing them. Clean up leaf and yard debris, and don't allow it to accumulate. Move compost piles well away from the house and keep weeds and brush cutback from the home's foundation. Recycle or discard all clutter that could make a nice mouse condo, especially straw and paper. Store pet food, indoors or out, in metal or hard plastic containers that resist gnawing. Stop feeding the birds, and squirrels as mice will scavenge the spilled seeds and see them as an invitation to come inside for a buffet.